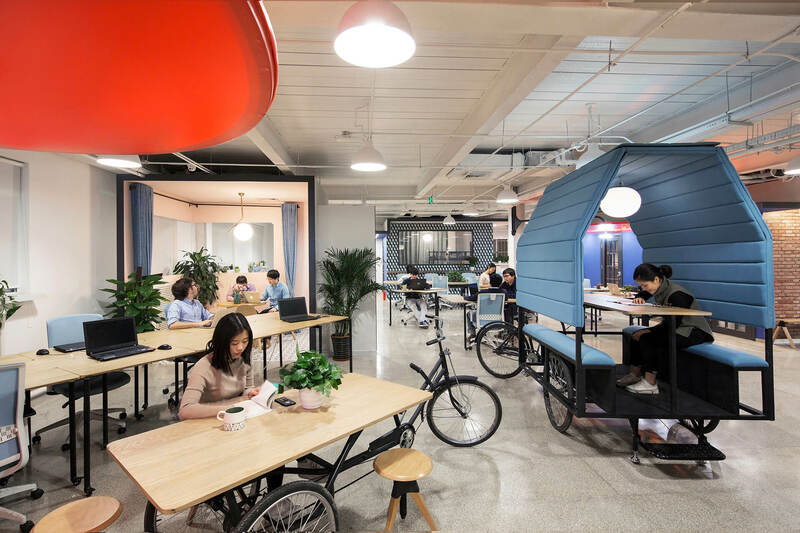 Headquartered in Beijing, Xiaozhu commissioned People’s Architecture Office and People’s Industrial Design Office to design House Parts Office, their latest office space located in the city’s hi-tech center. Xiaozhu (literally ‘small pig’ but homophonous with ‘short stay’) is a peer-to-peer housing rental website. The startup is China’s rival to Airbnb and part of the country’s new ‘shared economy’. Launched four years ago, Xiaozhu is now valued at $300 million plus. The unpredictability of such rapid growth requires a highly flexible work environment. Our design features spaces and furniture that easily combine and separate, mobile meeting rooms, and power outlets that swing to desired locations. Like Xiaozhu’s online business, the office interior consists of a collage of various domestic spaces. The design inserts the casual comfort of home life into the workplace, reflecting the company’s open spirit. House Parts Office is conceived as a house that has been divided and its parts dispersed throughout an otherwise banal office interior. Shared interior finishes between split spaces make apparent that adjacent portions refer to a single room. These sliced samples of domesticity include kitchen, living room, and bedroom and double as ad hoc meeting areas. House Parts Office also features converted tricycles – workspaces and informal meeting areas on wheels - that are inspired by our Tricycle House and the often unique living spaces found in China. Such spaces reflect Xiaozhu’s rental offerings, providing users with a wide spectrum of settings to choose from. 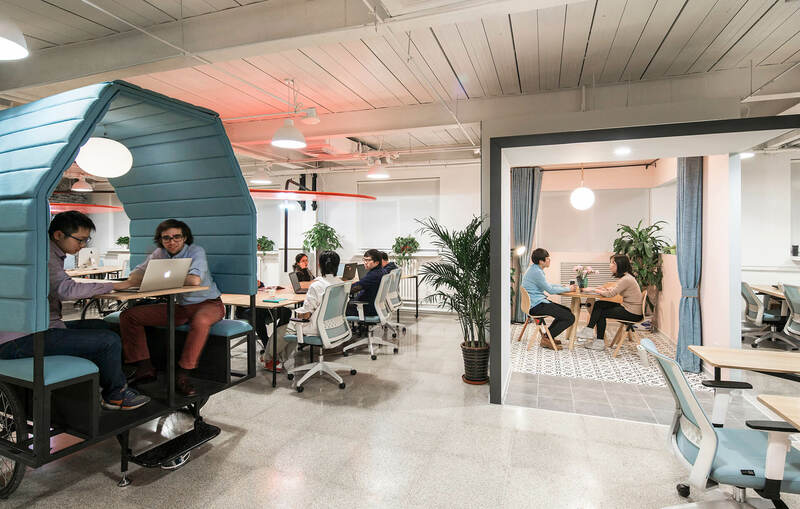 The office features custom-designed furniture by PIDO. Long span cantilevering tables supported by only four legs create undisrupted space underneath to provide seating flexibility. Not only does this allow for space to expand, but passersby can sit down and squeeze in for spontaneous conversation. Numerous mobile Tetris Tables can be detached, combined and rearranged to working in groups or individually. Red ‘umbrellas’ swivel to different locations to provide overhead light and electricity. A long conference table can be separated into three smaller tables, allowing the conference room itself to be divided into three smaller rooms when necessary. At Xiaozhu’s headquarters flexibility and diversity of workspaces and furniture facilitate spontaneous interactions in order to encourage the exchange of ideas. Such designs are essential in fostering innovation in China’s emerging service economy.